The linguist occupational field in the Marine Corps has numerous jobs broken down by specific language skills. To qualify for one of these jobs, a Marine must obtain and maintain a minimum proficiency of level 2 in two modalities (listening, reading or speaking) on the Defense Language Proficiency Test. The DLPT is the Department of Defense standard to determine foreign language proficiency and maintain quality control. The work of linguists in the Marines may involve direct supervision and participation in language translation/interpretation activities in support of the full range of military operations and intelligence matters encountered during contingencies, operations, and exercises. Formal schooling is provided to those Marines entering this occupational field (OccFld) as a part of the comprehensive training program for designated military occupational specialties (MOS) within the 26XX OccFld. However, required foreign language skills may be obtained through any combination of formal or informal training. These MOS will be assigned and voided by the Commandant of the Marine Corps only. Marines in this field need a score of 105 or higher on the general technical segment of the Armed Services Vocational Aptitude Battery (ASVAB) tests, in addition to the aforementioned qualifying scores on the DLPT. 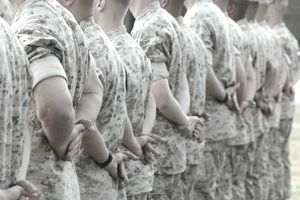 Since they'll be involved in high-level, potentially sensitive conversations linguists in the Marines must be U.S. citizens and need to be eligible for a top-secret security clearance and for access to sensitive compartmented information (SCI), based on a Department of Defense single scope background investigation.